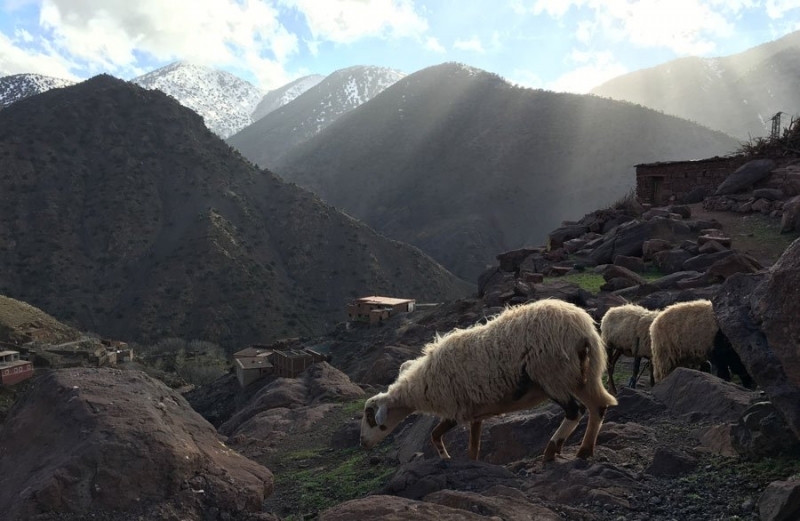 a guided trekking tour, you’ll experience the Atlas Mountains first-hand against the breath-taking backdrop of snow-capped peaks, luscious valleys and secluded Berber villages. 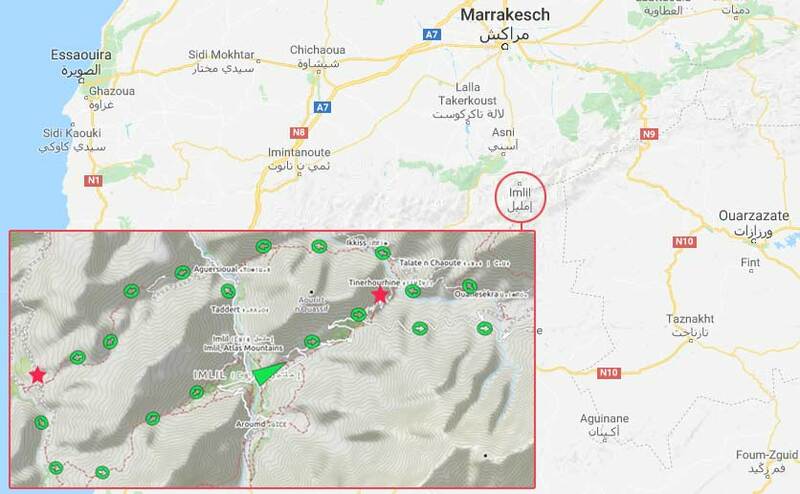 Marrakech lies near the High Atlas Mountains. It’s so close that you can see the snow-capped peaks when looking out from the city’s roof terraces. 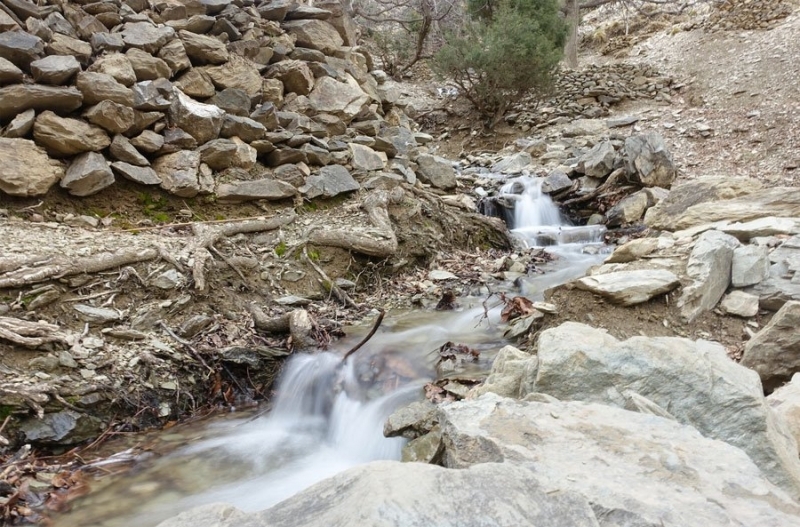 If you fancy a change from the hustle and bustle of the medina and a different type of countryside adventure, driving to the neighbouring mountains and going on a trek is a great choice. As it’s close by, you won’t have to spend too long travelling there either. Our trekking tour started in Imlil, now a famous starting point for climbing the 4,167m Djebel Toubkal, the highest mountain in North Africa. However, rather than trekking along this rather busy “mountain highway”, we chose to hike through a more remote and less populated mountainous area. There were three of us on the tour, as well as a professional mountain guide, a cook and another helper who took good care of the mules. Mules are essential because you won’t find any guesthouses, restaurants or proper shops on this route. Therefore, at the start of our journey, we packed all equipment and food for the next three days. Also, the mules carried most of our personal belongings so we didn’t have to carry these in our daypacks and so leaving us free to trek light. During our trek, we ascended to a maximum of 2,487 meters, which isn’t too extreme. 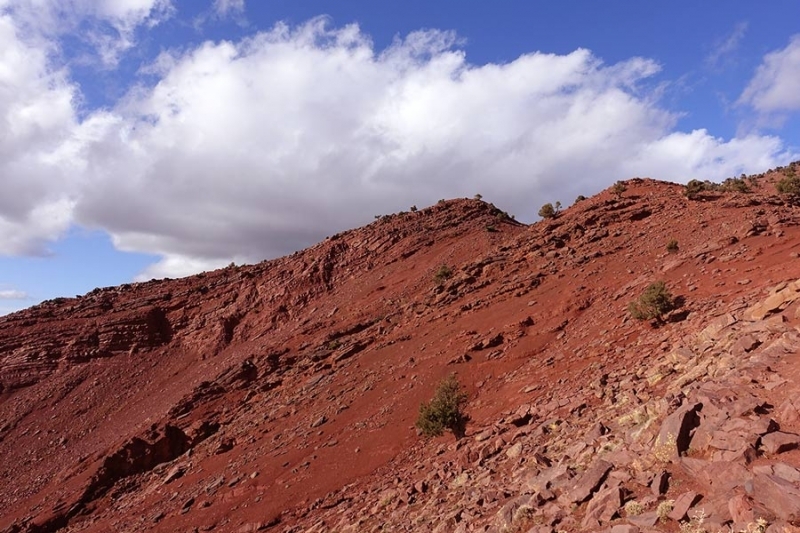 In terms of scenery, this route is better and is also less exhausting than the ascent to Djebel Toubkal. It’s also a better route for families to tackle, as well as anyone who suffers from altitude sickness. 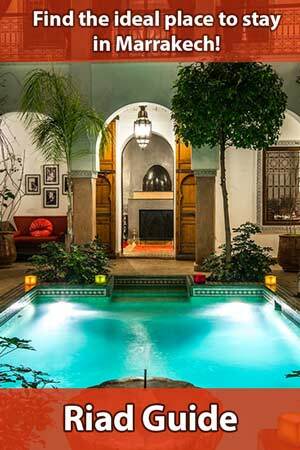 A Moroccan travel agency organises this 3-day tour, which can be booked online at Getyourguide. All you then need to do is arrive at the meeting point on time and then you’ll enjoy the magnificent surroundings over the next few days. We left Marrakech from the south and our tour began with a 90-minute minibus journey to Imlil, which lies at an altitude of 1,740 metres. Upon arriving, we met our guide and his two helpers and discussed the finer details of our trek over a cup of tea. Then we loaded up our bags and set off. After a two-hour climb through a pine grove, we reached the 2,280-metre high Tamatert Pass, where we stopped to enjoy lunch with a view over the Ouaneskra Valley and its terraced gardens. Then, our route took us around the valley and through two isolated Berber villages. We spent the first night in a simple Gîte d’étape in a little village called Tinerhourhine at an altitude of 1,600 metres. Our accommodation was basic but cosy and, from the terrace, we had a spectacular evening view of the mountain range at the end of the valley. The second day took us through the Imnane Valley. By midday, we’d reached the Aguersioual Pass at an altitude of 2,020 metres where we enjoyed some amazing views. After our descent into the Vallée de Imlil, we found our cook, Hassan, already waiting for us with lunch. He’d made a delicious tagine and salad. It’s interesting to note that the support team and mules left before us in the mornings and got ahead. This meant that we never had to wait and so enjoyed the luxury of arriving to the wonderful aroma of lunch that was promptly served. After our break in the Vallée de Imlil, we embarked upon the most scenic leg of our hike. Our route took us up the winding Tizi Oudite path to an altitude of 2,219 metres. Here, we walked through small groves of Phoenician juniper, high up on the pass. At the top, we stopped on a grassy meadow for a short rest. 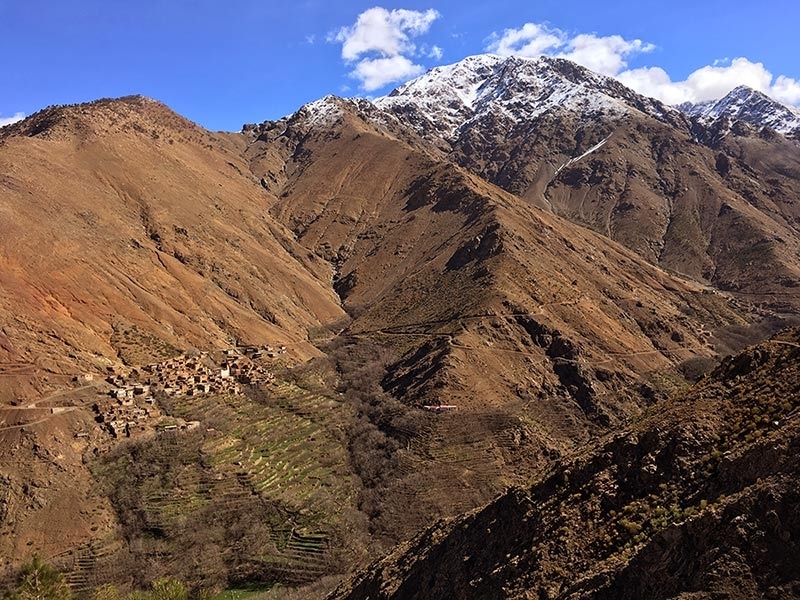 Then, we climbed another few hundred meters to our destination — the tiny Aït Aïssa Berber village at an altitude of 1,800 metres. Here, we spent the night in a comfortable little Gîte d’étape. 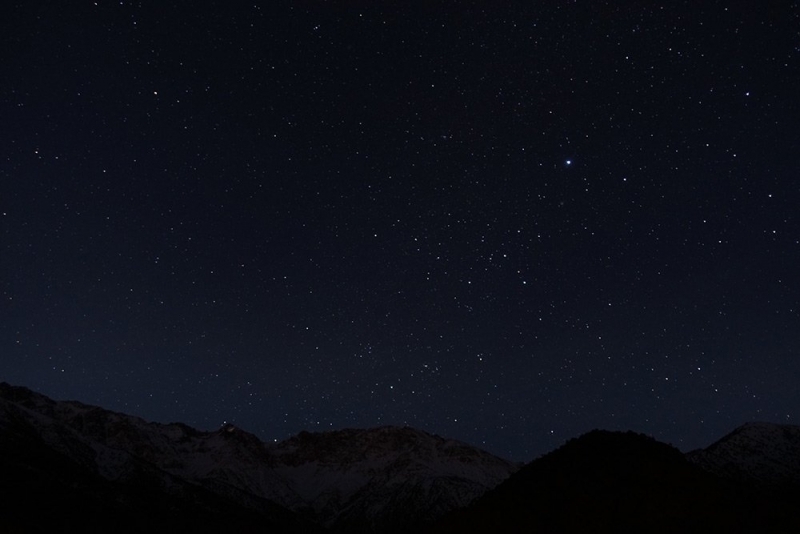 Naturally, we had panoramic mountain views to enjoy from the roof terrace and we took photos of the clear starry sky. Sadly, the final day arrived and we had to return to Imlil. 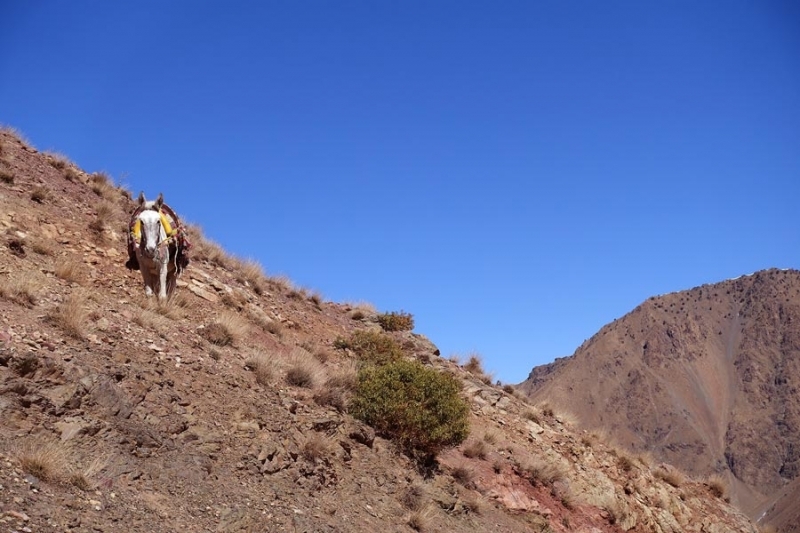 We left Aït Aïssa early in the morning and began our gentle ascent to Tizi Oussem at an altitude of 1,900 metres. From here, we were able to see the last climb of our trek. 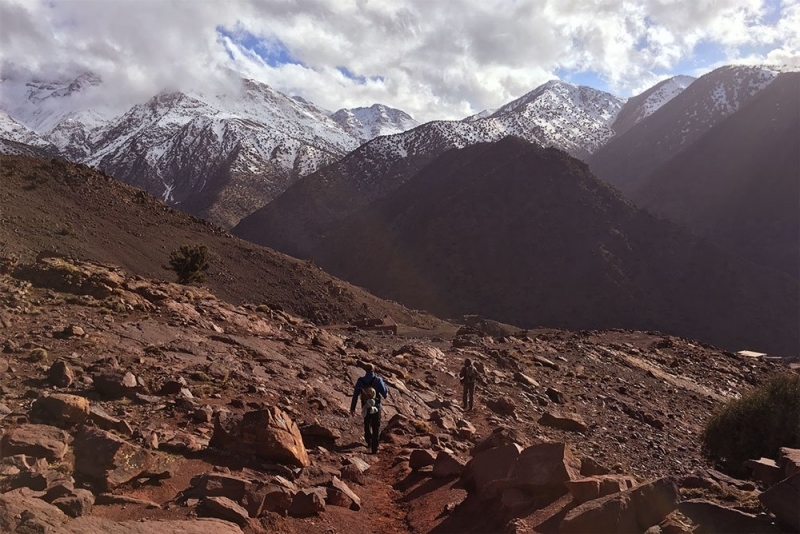 The leg across the Mzik Pass at an altitude of 2,400 metres required some stamina but we were rewarded with a breath-taking view over the mountains and valleys of the Atlas Mountains. In the distance, we could already make out the final destination of our tour but, before arriving in Imlil, we still had 700 meters to descend into the valley. 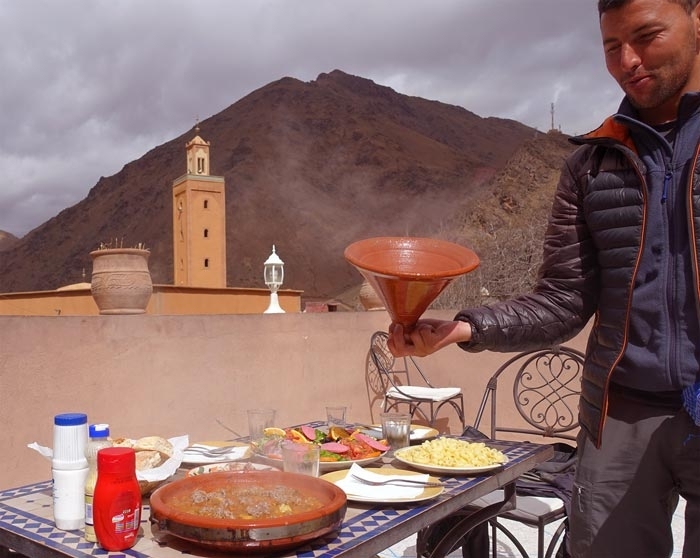 So, it would be another hour before we sat down with our team on our roof terrace in Imlil to enjoy a freshly prepared tagine and chat about our tour. After lunch, we packed our luggage in the van and returned to Marrakech, tired but in good spirits. This trekking tour is all-inclusive and everything is organised for you in advance. As a participant, you really don’t have anything to worry about. The entire tour was perfectly organised and co-ordinated. Three weeks before departure, the organiser contacted us with all the relevant information about the venue and equipment. While trekking, we were never unnecessarily delayed. 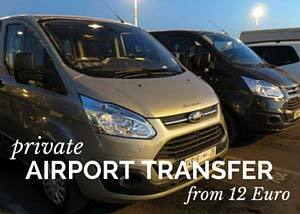 This included the punctual transfers to the meals, which were ready and waiting for our group when we arrived. 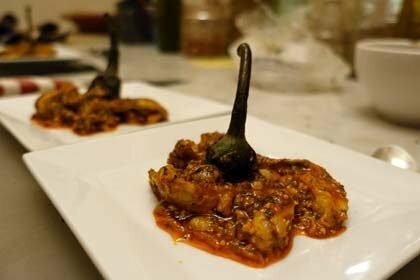 One of our group was vegetarian and was also well catered for. Our guide grew up in Imlil and lives there so he knows this region inside out and could easily make slight changes to the tour while we were on the way. He’s a professional mountain guide and can adapt the trek to suit the weather conditions (snow) and the walking speed of the group. He spoke English and French and always took time to patiently answer our questions about life in the High Atlas. He also took our individual needs into account, which definitely contributed to an unforgettable experience. 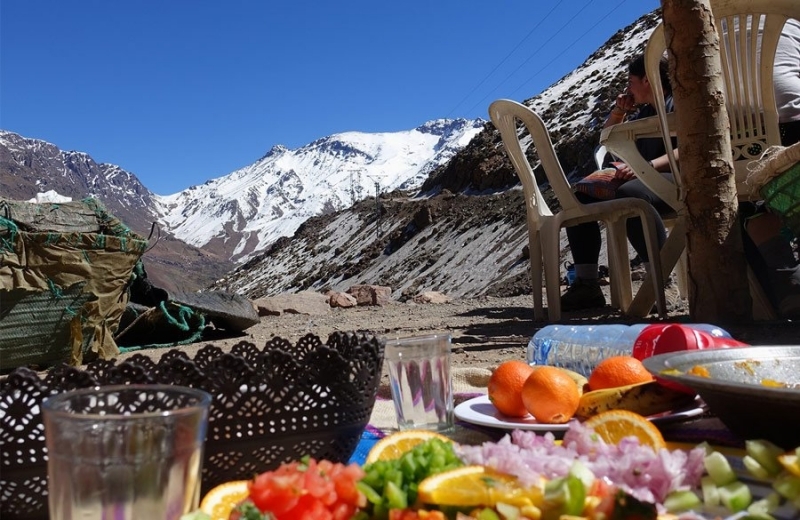 Even in summer, you may see snow on the summits of the High Atlas Mountains. 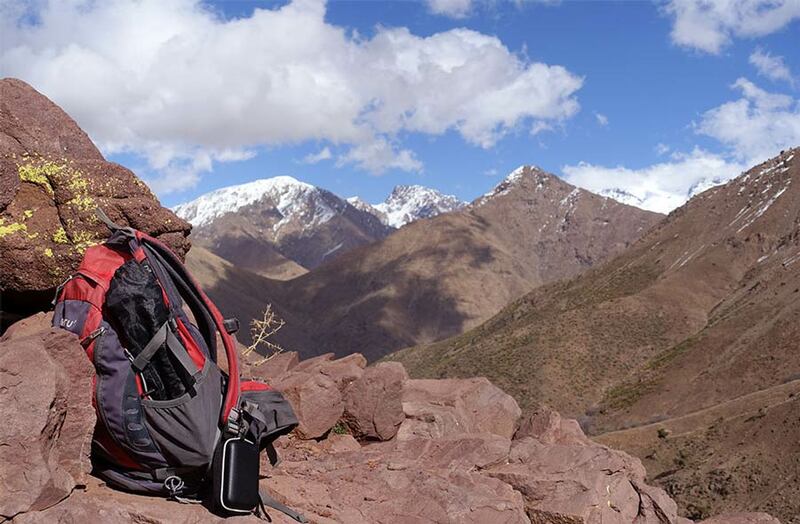 However, unlike climbing the Djebel Toubkal, you can go on this trekking tour all year without needing any snow equipment. 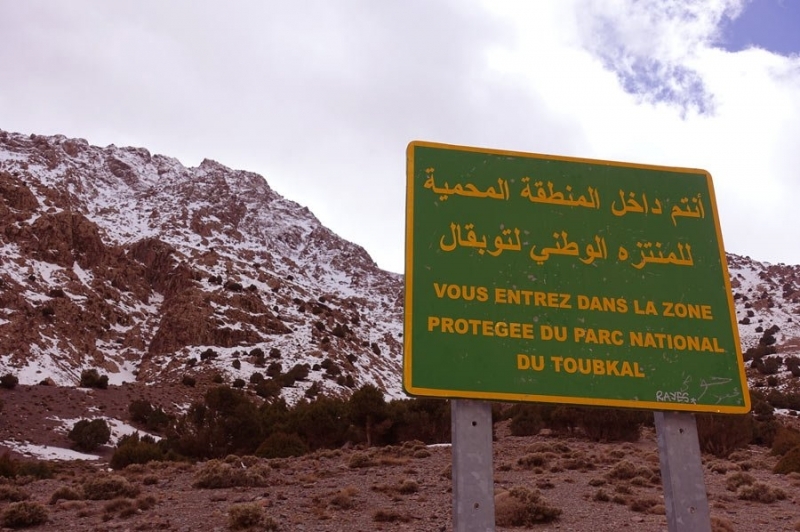 The route lies at a lower altitude and the highest point is 1,700 metres below the Toubkal summit. Also, you can take many different routes using the little mountain paths. So, even in the winter months, you can choose routes that are clear of snow. This trekking tour runs all year; however, when you go, be aware that you’re in the mountains so don’t underestimate the altitude and potentially low temperatures. In winter, it can freeze at night, so warm clothes are recommended, especially in the evenings. It’s a different matter in the summer when you should prioritise sun protection rather than worrying about the cold at night. 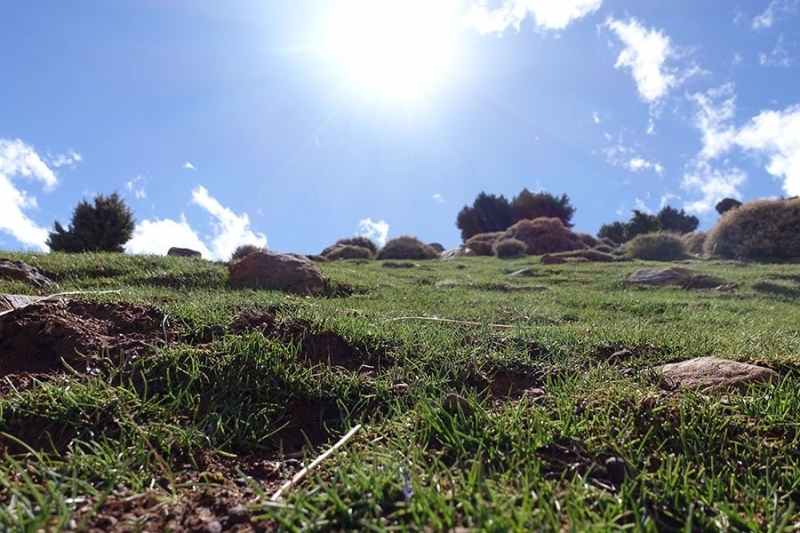 The Atlas Mountains look their best during the green months between March and November. The winter changes the appearance of the high mountains with snow-shrouded peaks that create a magical winter sports panorama. There are no public guesthouses or hotels on the tour. You’ll spend the two nights in Gîtes d’étapes that belong to the local and self-governing Mountain Guide Association. These are very simple yet comfortable and have several bedrooms with beds or mattresses. You really need to take your own sleeping bag but, if this isn’t enough, the huts provide woollen blankets. Since most of your luggage is carried by donkeys on this trekking tour, it’s a good idea to carry two bags with you or swap these around between the people in your group. Ideally, you let the donkeys carry everything you don’t need during the day and carry the rest of your equipment and some water in a daypack. This list covers the essentials. You might also find the following useful: trekking poles, a small first-aid kit (your guide will have one too, of course), blister plasters and gloves (in winter). In terms of the level of difficulty, this trekking tour is actually fairly easy. Most of the time, you’ll find yourself walking on little mountain paths. These can sometimes be steep but you never need to actually rock climb. You don’t need any special equipment or experience in the mountains. The simplicity of this tour is largely down to the fact that mules carry most of your luggage and you only need to walk with a light daypack. You don’t have to be a fit athlete to go on this trekking tour. Of course, it will help it you’re healthy and don’t underestimate the climbs and descents during the three daily stages. This hike is family-friendly and the mountain guides are experienced in taking children on their tours. If, for example, children in your group are very young, the stages can be modified so the group walks along with the mules. If a child finds it hard to walk at any point, he or she can ride on a donkey. In a nutshell, parents who would like to take children on this trek should ensure that their offspring are confident with walking and enjoy being in the great outdoors. 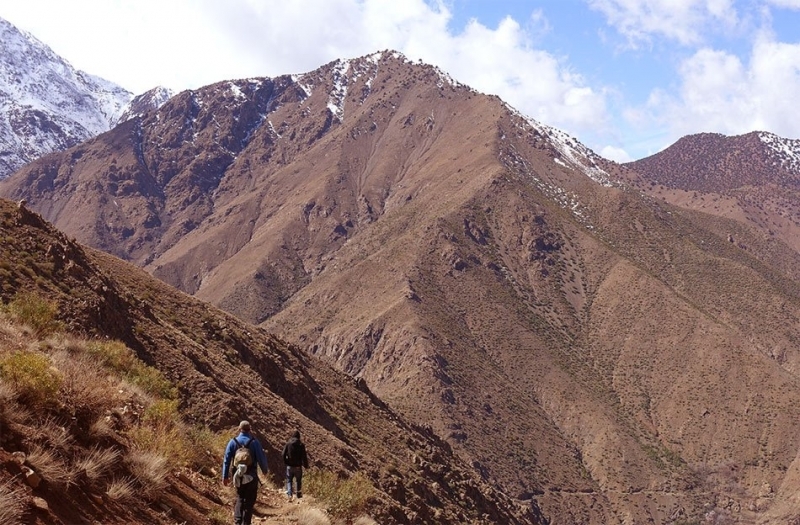 We’ll remember this trekking tour in the Atlas Mountains as a great outdoor experience. It was a stark contrast to the bustling everyday life in Marrakech, with a mixture of impressive scenery and the opportunity to take some exercise. Also, you don’t have to travel as far to get there as you would on trip to the Erg Chebbi desert. The trek costs 280 Euros per person and this includes everything the tour offers, except tips for the support team. 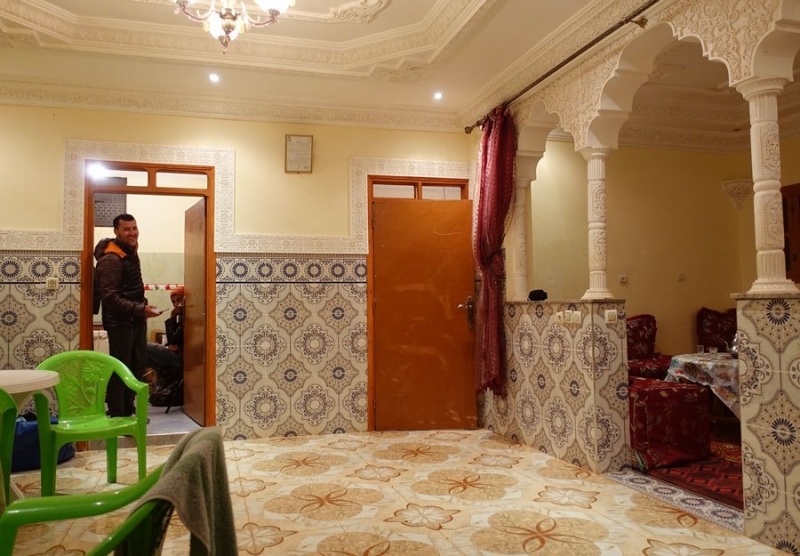 This price includes transfers to and from Marrakech as well as the guide, the cook, the donkey man, two nights in the gîtes d’etapes and all meals. You can book this tour in the Atlas Mountains online using Getyourguide. 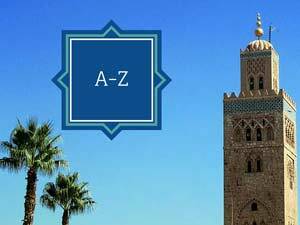 Upon booking, you can enter your Marrakech hotel address if you want the minibus to pick you up. After you’ve received confirmation, the travel agency will contact you with further details about the tour. I’m interest in Trekking in the Atlas Mountains (3 days) tour. However i’m traveling alone. Any change you know some other person in same situation or a group I could join? I’m in Marrakech 5.4. – 13.4.2019.